The International Committee of the Red Cross (ICRC) Pakistan is inviting applications from university students or recently graduated for ICRC IHL Internship Program 2019 for 3 months with 15000/- Monthly Stipend. The International Committee of the Red Cross ICRC internships allows for a general understanding of the ICRC, its mandate and activities in Pakistan and provide an opportunity for students and graduates to gain exposure to a real work environment of the ICRC. The International Committee of the Red Cross is providing great paid ICRC IHL Internship Program opportunities in Pakistan. 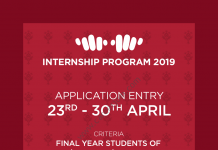 The International Committee of the Red Cross (ICRC) Pakistan announces its second internship program ICRC traineeship 2019 or ICRC IHL Internship Program 2019 in one year for students and graduates of Pakistan. After Selection in ICRC IHL Internship Program 2019 the interns will be attached with IHL department of the ICRC. During the internship they will be engaged in a number of tasks including legal research, drafting, vetting, organizing dissemination sessions, organizational and administrative support, translation of legal texts and other assignments related to various activities of the ICRC delegation in Pakistan. The International Committee of the Red Cross (ICRC) Pakistan looking for candidates who meet the following, mandatory requirements. Studying B.A./LLB or a graduate degree in International Relations from a recognized university. Graduates who have completed their studies in one of the above-mentioned disciplines not later than a year from the date of commencement of the internship. Proficiency in English and Urdu (written and spoken). Proven ability and willingness to work in a cross-cultural environment. Available for a minimum 3 months or more. Capacity for innovative thinking and for generating ideas and initiatives. Following Universities eligible to apply for the ICRC IHL Internship Program 2019 at Peshawar and Islamabad. ICRC interns will be offered a 3-month paid contract with a monthly stipend of PKR 15,000/-. The positions are based at ICRC office in Islamabad and Peshawar. For enrolled students, the applicant must provide in writing a full- time permission full-time availability for the internship period from the head of the department, in case the applicant is selected. ICRC will not provide any kind of boarding and lodging facility. In order to apply for ICRC Internship 2019 in Islamabad the documents should be sent to [email protected] and for apply in Peshawar, the documents should be sent to [email protected] .